The Fox 40 Breakaway Whistle Lanyard gives you quick and easy access to your whistle (not included) in emergencies or when you get separated from your group. 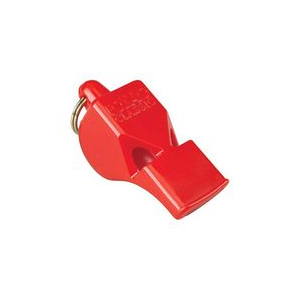 The Fox 40 Classic Pealess Safety Whistle is the whistle of choice for professional sports and Olympic competitions. It has a patented 3 chamber design and no "pea" to stick and impede sound. The harder you blow, the louder the sound. Sometimes, the only way to be found is to be heard. The loud, crisp sound of the Fox 40 Classic safety whistle cuts through other noise to help signal your location for rescuers-up to a mile away. Small and flat with no pressure points and no moving parts, the Fox 40 Micro whistle with breakaway lanyard is a reliable signaling device for safety professionals and outdoor enthusiasts alike. A reliable signaling device for the outdoors, the Fox 40 Micro whistle with breakaway lanyard is audible up to a mile away and has no moving parts to freeze, jam or deteriorate.